FIIs were net sellers of equity on Mon. and Tue. (Feb 18 and 19), but net buyers today. Their total net selling was worth Rs 13.4 Billion. DIIs were net buyers of equity on all three trading days this week. Their total net buying was worth Rs 36.1 Billion, as per provisional figures. Foreign Direct Investment (FDI) in India contracted by 7% to US $33.49 Billion during the Apr-Dec ’18 period, compared to US $35.94 Billion during Apr-Dec ’17. The decline may put pressure on balance of payments and value of Rupee. The government has approved a Rs 482 Billion recapitalisation for 12 Public Sector Banks to strengthen their balance sheets and help them to better negotiate RBI’s Prompt Corrective Action (PCA) framework. Six straight days of lower closes – due mainly to FII selling – had dropped the index below its 200 day EMA to the lower Bollinger Band by Fri. Feb 15. The index continued to fall further, and slipped below the 10600 level intra-day on Tue. Feb 19 – correcting more than 530 points (4.8%) from its Feb 7 top of 11118. News of PSB recapitalisation triggered short covering by FIIs today. Nifty pulled back to its 200 day EMA, erasing the losses made on Mon. and Tue. Daily technical indicators are in bearish zones. 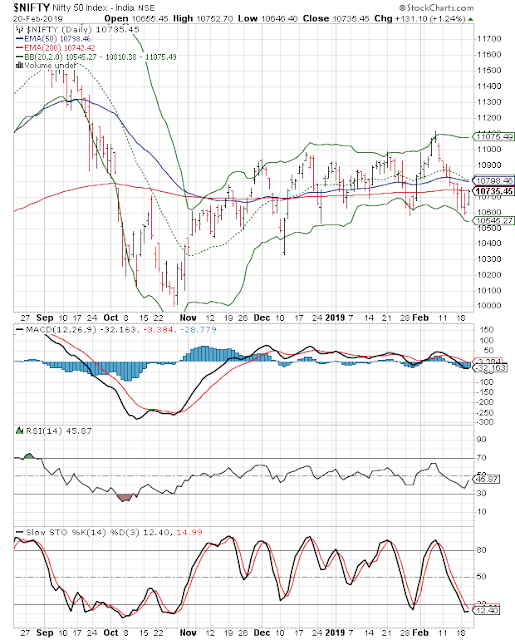 MACD is below its falling signal line. RSI is below its 50% level, but showing upward momentum. Slow stochastic is inside its oversold zone. The pullback rally is likely to go past the 200 day EMA. Note that the 20 day SMA (middle band – marked by green dotted line) is merging with the 50 day EMA, and the two together can provide overhead resistance. Nifty’s TTM P/E has moved down to 26.5, but remains much higher than its long-term average in overbought zone. The breadth indicator NSE TRIN (not shown) is in neutral zone after a sharp fall from its oversold zone, and can limit near-term upside. The worst may not be over for Nifty. The probability of a fall to 10000 or even lower remains high – despite heavy buying by DIIs. Decreasing inflows into equity mutual funds and uncertainty about outcome of general election are taking a toll on bullish sentiments. Small investors need not sell in a panic. Neither should they attempt bottom fishing. Sitting on your hands may not be particularly exciting, but can be a good strategy in a volatile and directionless stock market.